During our regular dance season, Dance Unlimited offers 1 -day dance camps for children ages 3-8 years old on the 3rd Saturday of every month (excluding December & May). 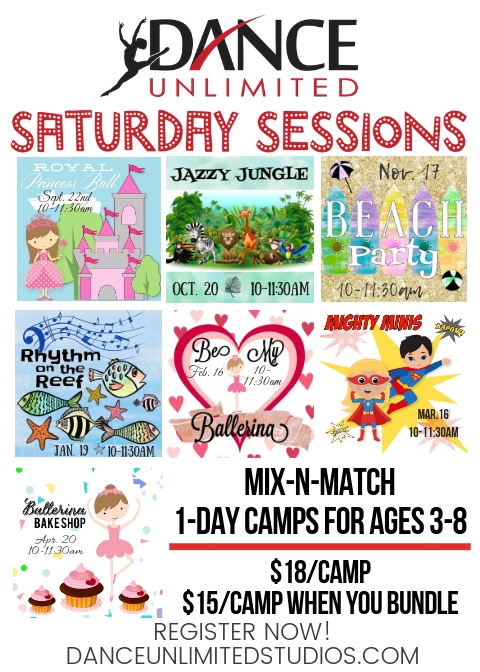 These camps are perfect for those that cannot commit to a weekly class or for parents who are looking for a fun, entertaining way for their kids to learn something new while they run errands on a Saturday! Campers will learn dance skills, choreography, play games and make a craft and for the icing on the cake - a performance for their family and friends and the end! Take advantage of this unique and fun experience. Select "Drop In Classes, Workshops & Camps". Remember, to receive the special discount, use the code "SATSESH" when you register for two or more camps! We will manually apply your discount and contact you to complete your registration.